The art of Judith Page and Collectibles from Africa and beyond. A unique shop in the historic town of Saguache, in the high alpine San Luis Valley of southern Colorado. from 11:00am to 4:00pm, or by appointment. (Closed for the winter from January - April except by appointment). The historic building was built in 1881 and is located at the corner of San Juan and 4th Street in the revitalized downtown district of Saguache. The shop is owned and operated by Dean Coombs and Judith Page. Dean is the third generation printer and editor of the Saguache Crescent, the last weekly hot lead newspaper in the country. 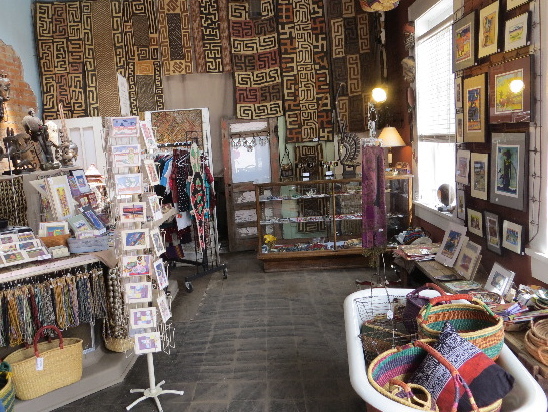 Judith has been producing & selling her artwork in the San Luis Valley since 1998. Dean has been collecting African beads and ethnographic artifacts for twenty years, much of which is on display and/or for sale at Magpie. Collectors often seek Dean out because of his rare and diverse collection of art and especially his vast selection of high quality beads. Judith has been creating a wide array of original art, reproduction prints and cards for decades. Her original images are primarily mixed media illustrations, many of which are also available as hand illuminated prints.